Above all, our skilled professionals have a passion for what they do. Whether you need help with a kitchen or bathroom remodel, water heater repair, gas or water piping, or the really fun stuff like drain cleaning and clogged toilets, Big Birge Plumbing will be there with a wrench and a smile. 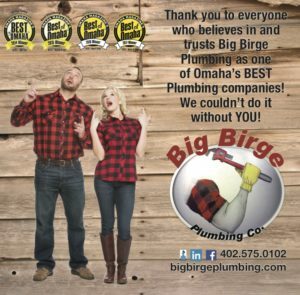 Call Big Birge Plumbing at (402) 575-0102 for your next plumbing project and join our family of satisfied customers! Even before starting his own plumbing company, Brad knew the value of an honest, hardworking tradesman—because he was one! He still is one, for that matter, and makes sure everyone on the Big Birge Plumbing team shares his work ethic, and his wife, Lallenia, builds the community spirit and culture of fun. You don’t have to hire a plumber who leaves a mess and treats you rudely. Trust Big Birge Plumbing for exceptional service and clean, honest plumbers. We handle service plumbing calls, residential remodels and commercial plumbing jobs in the Omaha-Metro Area. You can also rest assure that we are licensed, bonded, and insured. If you take pride in the American culture then you will be excited to know that Big Birge Plumbing installs American-made products whenever possible. Get to know more about our team on the Meet Our Crew page or hear from our owners! Looking for an Omaha plumber with honest service, fair prices, and American-made products? Contact Big Birge Plumbing at (402) 575-0102 right away!